The spooky forest biome would be a new biome similar to the Roofed Forest biome, but with some major differences. Witches and Endermen will spawn more often in this biome. Witch huts will spawn in this biome about as often as they do in swamps. Spooky trees: twisted trees, slightly larger than an oak, with no to few leaves. Wood and Leaf type: Dark Oak. General appearance: The ground would be podzol, and the leaves would be tinted about halfway in between the "Forest" and "Desert" biomes, although the creeping vine leaves would be greener than the other types of leaves. This would be the major addition. It would be a plant made of leaves that chases the player. If the player touches any side of the leaves, then they will be affected with the "Hallucination I" effect for 90 seconds (see below). The plant's leaves would be a new type of leaves, "Creeping Vine Leaves". The leaves would start at the base of the plant, and creep along the ground towards the player by growing more leaves. The leaf closest to the player will spawn a leaf diagonally or orthagonally (straight) in the direction of the player (but not corner-to-corner). The leaves can be collected with shears, and only creep and give the Hallucination I effect if they are connected to the plant base by other creeper leaves. Breaking the leaves has a chance (same chance as with Oak Leaves) to give a Creeper Vine Sapling, and the base always gives one. Planting this sapling on podzol will let it grow (growth time: same as an Oak Tree) into a fully functioning Creeper Vine. Before a creeper vine grows any additional leaves, it will look like a simple ground bush, but it will have 1-3 tendrils of leaves coming off of it. The base itself will look like very dense leaves, but will be fastest to break with an axe. Keep in mind that breaking the base would disable the whole bush. Creeper Vine leaves can be up to 20 blocks away from the base without decaying, and they won't try to grow past this border. The Creeping Vine Saplings can also be put in a flower pot (it is also found in witch hut flower pots in this biome). If the block above the flower pot or to the sides of the block that the flower pot is on is empty, then the flower pot will grow vines there at the same rate that a vine block would. The flower pot will update its graphics to show this, connecting the creeper sapling in the pot to the vines. The hallucination effect is a new potion effect applied when a player touches a creeping vine. It causes the player to see mobs that aren't really there; these mobs disappear in a puff of smoke if the player touches or hurts them. They behave like a normal mob, but any projectiles (witch potions, skeleton arrows, etc.) are thrown, they disappear in a puff of smoke. Hallucinated creepers that try to explode will vanish, too. This vanishing effect applies to anything that would cause a change to the world, the player, another mob (that's not hallucinated), etc. A Potion of hallucination can be obtained from brewing a Creeping Vine Sapling into an awkward potion, and the strengthened version (with glowstone) would cause hallucinations to happen twice as often. This potion is available in all the traditional variants (splash, lingering, extended, strengthened). P.S. This is my first post so any suggestions/tips/ideas etc. will (probably) be appreciated. Note that I didn't know SethBling's vine gave you slowness, as my idea is pretty similar. I would've added this citation earlier, but I couldn't find the video (somehow XD). Ooooh boy could you split that 'creeping vine' part into some paragraphs? Right now that's a painful wall. I can't for the life of me understand why this plant mob would give the Wither effect? That's like getting snake poison from a dog bite. I could maybe get behind the mob minus that part. The Wither effect should just be left to... the Wither. Hence the name. The biome sounds a bit cliched but still manages to be a decent idea. It was supposed to be a poisonous plant, but with the ability to kill the player. perhaps I should change it to poison...? Thanks for the format change. The potion effect thing... Poison seems to make this thing a stationary cave spider, and Wither just makes no sense whatsoever (mind you, Wither effect steals health, it doesn't just super-poison). I guess poison could work, but I personally would go for a new potion effect altogether. It's also good to see a decent first post. Most first posters here post godawful suggestions and then actually defend them. Ummm.... A creeping vine? What? That is out of the ordinary. As for the biome itself, it sounds cruel and harsh, so I'm not supporting this. it sounds quite interesting, but the witch and the enderman parts sound pretty painful (witches are one of the most dangerous non-boss mobs in Minecraft, behind creepers and skeletons), but I could see how this could be a good biome. I'm giving it a support for now. Now this is pretty unique. A good "Halloween"-themed biome. It gives a creepy feeling, but isn't horror, so it could fit in Minecraft. I like the creeping vine, though 24 blocks might be a bit too far for it to grow. Do creeping vines only spawn once, or can they occasionally spawn naturally when the biome is loaded? I don't think the creeping vine needs a new status effect; perhaps it could give a combination of poison and nausea? @cerroz Thanks for the input! If I think of a good potion effect idea (something like "fear"), then I'll add it instead, or I could do poison and nausea, like jdc997 suggested. @jdc997 Creeping vines only spawn once. 24 blocks is a bit too far though... how about 20? Ummm.... A creeping vine? What? That is out of the ordinary. As for the biome itself, it sounds cruel and harsh, so I'm not supporting this. A creeping vine wouldn't be that out of the ordinary. And can you name another cruel and harsh biome? I think we need a harder biome to challenge experienced players. It's not that cruel and harsh, either. I added a new potion effect, "Hallucination". It is obtainable by the player in a Potion of Hallucination, along with all the traditional potion variants. this is a very well thought out suggestion, its new, interesting, challenging and all around quite awesome. it has my Full Support. Why thank you! I'm glad other people think this is a good idea! Personally, I think this is a good suggestion. This would really help for players trying to get to the end, as ender pearls are very difficult to come by. The hallucination effect is definitely original, and so are the creeping vines. This thread is very well-executed. Why thank you! I'm glad people are supporting this! I feel like this is too similar to the roofed forest biome already added in game. 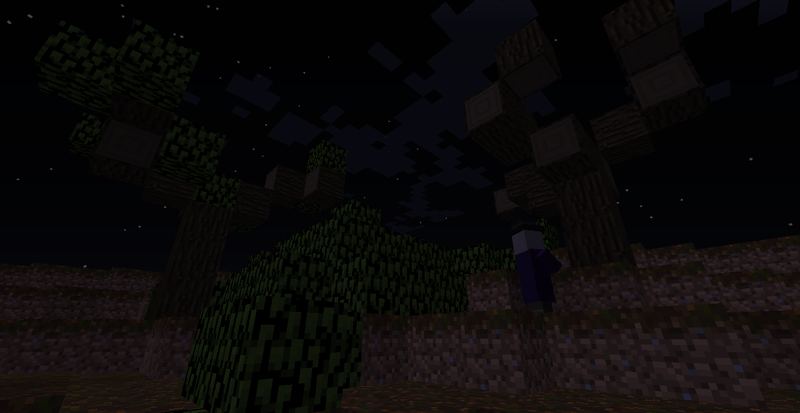 It can get dark enough (even in day) that mobs spawn. It may be similar, but I think there are ample differences to make it a new and original idea. I was looking for that video! Sorry about that, but I couldn't find it, and I didn't want to include an incomplete citation. I'll add that in now! Thanks for the change of heart! I do agree that witches and endermen are powerful, but this biome is best avoided by early-game players anyways. ooohooohoohooo! interesting and original. i support. I edited because... ummm... it gltiched... and was last edited... 58 minutes from now?? ?